DesignCrowd is a crowdsourcing platform for businesses to post design contests for an element they need, whereupon designers compete with their skills to win the prize money. They have a sizable contingent of skilled designers who’ll offer up their talents, so you can rest assured that you’ll have a healthy selection of concepts to choose from. However, be aware that to get the best designers, you may have to invite a few of them to your contest, and then spend time reviewing, commenting, and critiquing so that they can make changes as needed. With the DesignCrowd platform, you get high-quality designs at great value. More than just logos, their contingent of designers also do web design, T-shirts, app designs, postcards, and more. DesignCrowd works on a simple crowdsourcing model: you give a detailed design brief, pay a fixed price, and then designers compete to win the prize pool. The result is that you get dozens of submitted designs to choose from, all within a decent budget. If you’re still unhappy with the selection of designs after all that, DesignCrowd also has a money back guarantee. One of the best features of DesignCrowd is their customer support team. Many of their users have commented that while initially unsatisfied with their designs, their customer support team worked with them from the start to the end of the project and were happy to extend the length until they got a design they loved. Is DesignCrowd for you? Let’s take a look. When we look at the quality of designs offered by similar companies, DesignCrowd surpasses the average by far. They hold some very talented designers who can offer nothing but the best quality, usability and a keen eye for detail. The designs are so clean, strong and unique that some of them even beat design studios, but what makes DesignCrowd so good is that you can hire an upcoming designer for a great price, before they hit the big time and start charging big amounts. Even though it doesn’t get into all the specifics, the DesignCrowd brief is still fairly detailed. They also deserve special mention for allowing you to choose how long your contest will last. DesignCrowd has a great designer profile interface in which you can filter designers by earnings, positive feedback, experience and more. The freelance option lets you approach specific designers and hire them for a one-on-one job. DesignCrowd is one of the only contest websites that lets you give contest participants individual feedback – largely because each entry is private, which is a great way to ensure originality and creativity. At the same time, if you want to get a second opinion you can always share your contest entries with friends and get their input. With their cute icons and thoughtful color scheme, it’s obvious DesignCrowd put a lot of effort into their website. The result looks and feels great, but unfortunately doesn’t entirely translate to a user-friendly experience. Part of this is because this isn’t strictly a logo design service, so there’s a lot of extra content to go through. The rest of it is because DesignCrowd’s navigation isn’t always as intuitive as it could be – you could spend some quality time snooping around for the gallery page before you find it hiding below the fold or behind another link. Luckily, posting a contest isn’t nearly as confusing. There’s a clearly marked link at the top of each page which sends you to the signup form and from there to the creative brief, the payment process and the beginning of your contest. At the contest stage you’ll be asked to give feedback and comment on the designs you receive. After picking a winner, DesignCrowd will move you to the helpful “design handover” phase, where you can talk to the winning designer, request small changes and finally download your logo files. 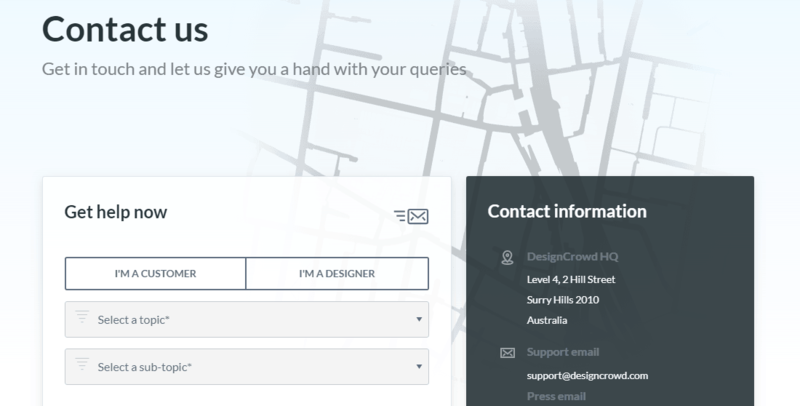 DesignCrowd maintains active Twitter and Facebook accounts where you can contact them with support questions. They also have a great FAQ page, an email contact option and even a live chat box for the purchasing stage – at least during business hours. Of course you could always just pick up the phone and call them, but then you’d have to choose between the 7 (yes) different international numbers they provide. The support you’ll get will be as prompt and efficient as any in the business. Overall, finding information about how DesignCrowd pricing works is not an easy task. Even the presale live chat feature demands that you open an account before they can tell you how much it costs, and the information doesn’t appear anywhere on the site unless you’re logged in. Indeed, pricing on DesignCrowd is a little tricky. On the one hand, the minimum price is very good for a contest website. On the other, a glance at the actual contests shows that most of them don’t go much lower than $400. This doesn’t mean you can’t get a good contest going for less, but it could mean that the better designers would be reluctant to participate in it. Then again, the price packages are customizable, so you don’t have to jump to the next package to improve your chances. DesignCrowd also offers some small additions that could help draw in designers, such as a $20 participation fee for the top runner ups, or the option to give up your refund guarantee and commit to awarding a prize. DesignCrowd is first and foremost about quality, and that’s what you’ll be getting. Beyond the slightly confusing website and the higher bid options, there’s a world of exceptional designers just waiting to give your their best shot. The good support and incredible features are a good indication of the emphasis that this website places on customer service and satisfaction. DesignCrowd has your interest piqued? Take a look at some of its features.